Martin the mouse was hunting (a very generous term) for food one morning at the rest stop on Highway 80 in the desert of Nevada. Martin was hunting for bread crumbs, tortilla chips, parts of a ding dong; basically any food left underneath the outdoor benches. Tonight the hunt was good; many humans had dropped food the day before. Martin was eating some food, and carrying some more to his small home in the rocks on the border between the rest site and the desert. He had a family to feed, but he liked to snack while he hunted. On a small hill, watching the mouse with interesting delight was Mike, the local King Snake. Mike was hungry, which was bad news for Martin. Mike is a big snake, and he knew it; six feet long, and four inches in diameter at his widest point, his head alone weighed more than Martin’s entire family. Mike is fast too, his bite lands almost before he begins his strike. No rodent in the area is fast enough to dodge this snake’s attack, once he is in striking range. Martin did not see or smell Mike, maybe because he was munching on the leftovers of a cheese burger while carrying gummy bears to his nest. (The food pyramid for a Mouse is rather flat). Martin’s nest was reasonably hidden from plain sight. He had to scurry around a stack of rocks into a small flat area, and then his home was at the back of the cul-de-sac, underneath two more rocks leaning into each other. Martin shoved the gummy bears just inside is home, and turned, running back to the picnic table for one more load. With tonight’s haul, his family would be fed for a few more days. Mike the snake watched as Martin ran underneath the table; that is when he made his move. Instead of attempting to chase Martin in the open area, mice are good short distance sprinters, Mike chose to hide in the sandy area outside Martin’s home. When Martin rounded the corner past the cover of the rock pile, he would be hopelessly exposed in the open, with nowhere to hide. Then, Mike would have his dinner. Martin had found the remainder of the cheeseburger. It was a big chunk of meat and cheese, with a little mustard; delicious. He carried the food slowly, because it was massive enough to obscure his forward vision. When Martin rounded the corner into his cul-de-sac he did not see the hunting machine coiled at the entrance to his nest. But then he did. Mike was coiled; his huge jaw was slightly open at the end of an “S” formed by his neck. He was in his striking pose, and Martin knew it. Running was not an option, because movement initiated the basic instinct in a snake to strike. So, Mike gently set down his food, and looked straight into the eyes of Mike the snake. “So Mike, what brings you down to the rest stop tonight,” asked a trying to be calm and cool mouse? “Dinner with you,” hissed the snake. “Actually, as you have probably figured out, you are dinner.” Mike got cocky when he knew he was winning. 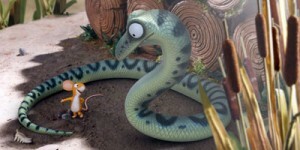 “How can a big snake like you be satisfied with a little mouse like me? Wouldn’t a King Snake such as yourself require more than a little something like me to be satisfied,” inquired the frightened mouse? Inside Martin was furious, he could not allow anyone to threaten his family; yet how could he protect them. Soon the snake would tire of talking and just eat him. “Maybe Mr. Snake, you won’t win the battle against me. Maybe I will escape to protect my family and you will go hungry. Maybe I am tougher than you think.” Martin was so afraid he could hardly stand it, but he had to try – for his family’s sake. Martin’s trick had worked. The incredible ego of a King Snake was known to all, and suggesting that a lowly mouse could stand up to him in battle would be too much for Mike to bear. The snake threw his head back even more and continued to laugh. That is when Mike began to run. The shortest point between two places is a straight line, and that was the course Martin took. He ran up and over the coiled body of Mike, and before the snake could react, Martin dove with outstretched arms, landing into the entrance of his waiting nest. Martin slid to safety amongst the gummy bears; while Mike looked down to see the unbelievable story being written before his eyes. A mouse had escaped his trap, and easily too. A mighty snake has been beaten by a lowly mouse. Martin held his family close, and then they slowly moved back into their nest, bringing the gummy bears with them. Pride comes before the fall; always. Sometimes though, when pride or ego just makes us stumble, we learn enough to adjust our attitude back towards confident humility, and then we don’t fall. I recently let a damaged ego begin to twist my thoughts into anger and resentment, only to realize that my ego wasn’t damaged at all; I had overinflated it to a point that it got in the way of rational thinking. I believed that I was much more than I really am. So God, in His subtle way, shook me up to get my attention. Afterwards, realizing I was out of bounds, I made a course correction and changed my thinking; I stumbled but I did not fall. Not surprisingly then, soon God opened up another path I had never considered, a path even better than the one I thought I had missed. God will use the small and seemingly foolish things in our life, (like my ego) to prove His wisdom trumps all; His plan is the best. This entry was posted in Living a Christian Life, What's New With Michael and tagged compassion, ego, forgivness, God, Jesus, love, mouse, pride, snake, Thanks, trust, understanding, Wisdom by Michael Obermire. Bookmark the permalink.